Hello everyone! The travel team has enjoyed a successful first week on bridge maintenance. The week started off with an inventory check and an in-depth inspection of all the bridge components. With no major issues found, the team then began installing the cover planks to give additional stability to the bridge. They painted two coats of the same paint used for the rest of the bridge on the planks, and then started drilling them in. They plan to finish the installation of all 53 planks today. Other tasks completed during this week include securing the approach decks to the concrete for lateral support. After today the team will then switch its focus to our new water supply project, conducting water tests and collecting information from the community. 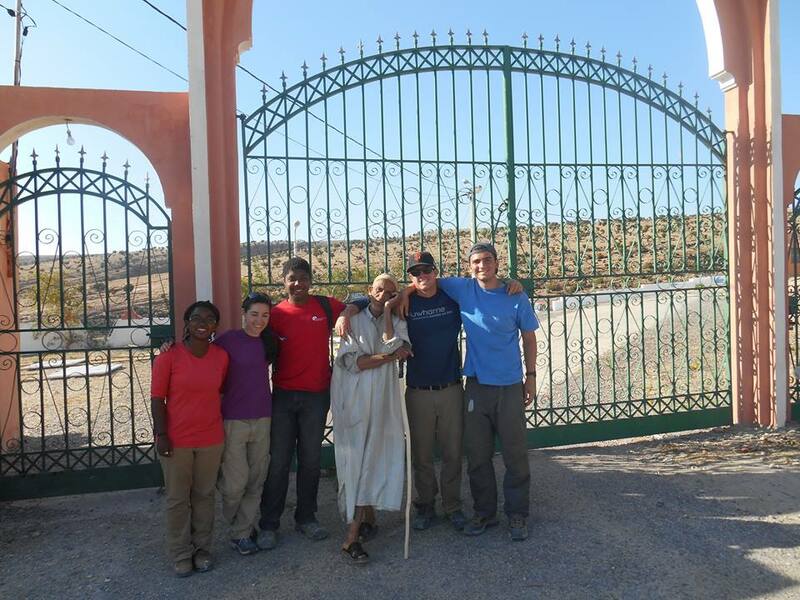 The team is happy to be back in Morocco and helping out the great community of Ait Bayoud! 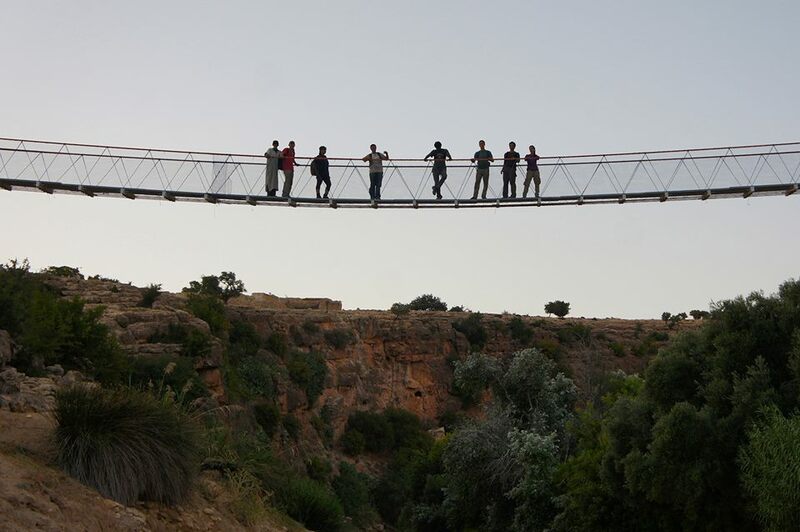 Just a quick blog post to announce that we have another EWB Morocco program trip underway! Students Jenn Mahan, Niger Little-Poole, Lilly Wang, and Lindsey Wickman left for Ait Bayoud last Friday, August 1. They will be returning to New York on August 23. For the first week, mentor Andrea Shear will be joining them to work on bridge maintenance tasks. Then, water mentor Colin Barrett will join the team to do more assessment for our water supply project in Izguaren. The team is hoping to get more information about water quality and accessibility, as well as source a lot of the materials we will need for the future of the project. Hey everyone! This is Devin writing on behalf of the travel team! I just got a call from Nicole and Adam and I have some exciting updates from the team. Despite the snowstorm delays from JFK, they were able to catch their connecting flight in Casablanca and arrive on schedule in Ait Bayoud. Over the past week, the water team has investigated the spring, talked with the Rais (president or mayor of Ait Bayoud) and traveled to Ilzgouran, where they stayed overnight and talked with the community some more about what they wanted to see implemented. They have conducted numerous water quality tests in the spring and other wells. The bridge team has also been very productive this week. After completing inventory on the first day, they started vibration testing and hinge construction. By tomorrow both tasks should be done! 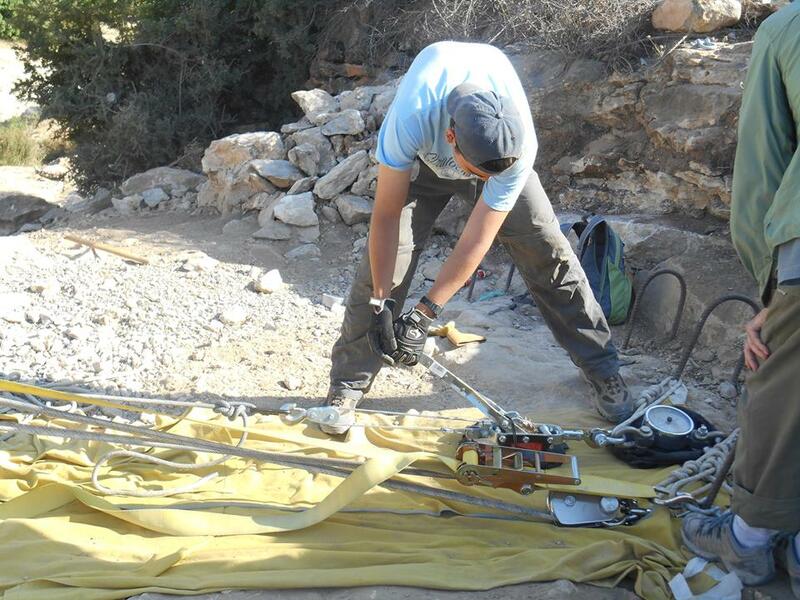 Over the course of the second week, the team will hold community safety and education talks about the bridge, as well as installing firehose over the hand ropes to protect them from abrasion. Overall, the whole trip seems to be going on schedule and without many hiccups! The team has also been having a lot of fun in Morocco, trying to eat huge tajines and drinking Tahami’s famous tea. They will go to Essaouira on Sunday and stay for the day on Monday to rest. Hopefully they will be able to access the Internet and update the travel blog with more specific day-to-day events! I’m looking forward to hearing more! Hello Everyone! The students and mentors of the Columbia EWB Morocco chapter have been hard at work preparing to send a travel team to Ait Bayoud for what we hope is a very successful assessment trip! The travel team consists of students Nicole Lewis, Adam Sherman, Cherry Ma, Michael Falkenstein, Noah Zweben, and Samantha Weiner, along with mentors Ted Segal and Colin Barrett. Everybody but Nicole will be leaving from New York JFK later today, and Nicole will meet up with them in Morocco from England, where they will be met by our Peace Corps volunteer Lee Allen. The team will be in Morocco for two weeks , and will return to the U.S. on January 19th. 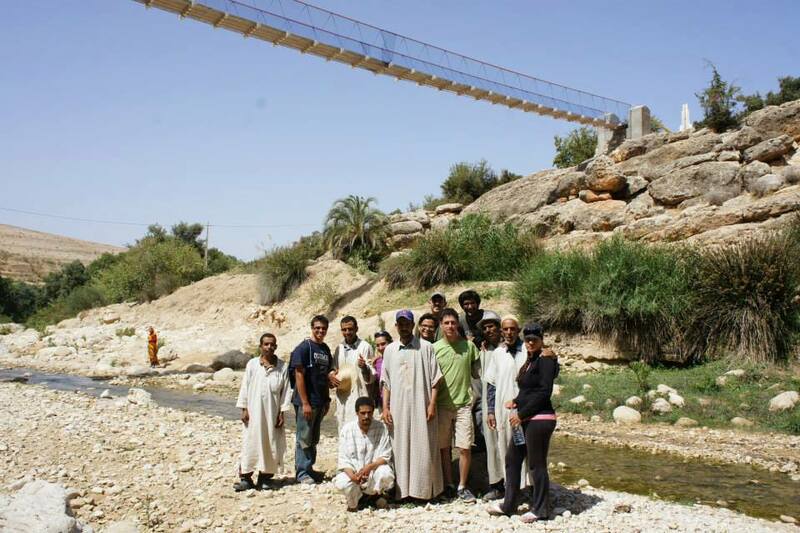 While in Ait Bayoud, the group will break off into two teams, one for bridge maintenance and one for water project assessment. The bridge team hopes to conduct thorough inspections and vibrations testing to ensure the continued safe usage of the bridge. They also plan to implement a new hinge design for the west bank entrance of the bridge, as well as protective covering for the hand ropes. Finally, they hope to hold safety lessons with the community to educate them on the more technical aspects of the bridge. The water team will primarily be doing assessment work for a new water distribution project in Ilzgouaren, a poor and isolated neighborhood in Ait Bayoud. They will be testing the water quality of the river and of a nearby spring, and assessing the feasibility of various pumps and distribution systems. They will be visiting Ilzgouaren to get more information on attempted water wells and to further community involvement. The water team also plans on constructing a weir at the spring to determine flow rates. During the trip we will try to post as many updates on the trip as possible, but there will definitely be more detailed accounts once the travel team returns. We hope that this trip goes well for them and we wish them good luck! One month. It’s amazing to think that’s how long it has been since we left Morocco from this summer’s implementation trip. 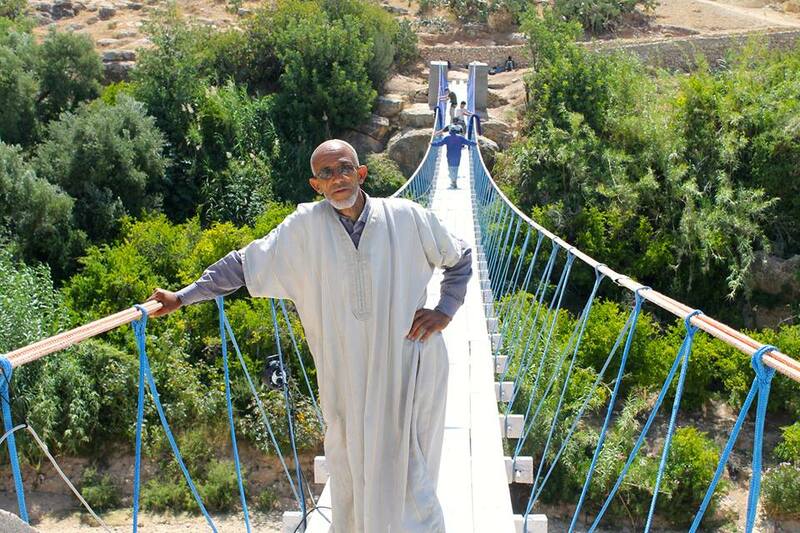 As we walked away from our final day on the bridge, peering back at our work as community members of Ait Bayoud crossed for the first time, there was an incredible array of emotions among us. I for one felt joy at seeing how excited the community members were, relief that we had completed the bridge on time, excitement for the future of the bridge, and even sadness for leaving the site that we had worked so hard on for the three weeks prior. Yet even with all of these emotions, and the evidence of the completed bridge before our eyes, it was still difficult to believe that the bridge was actually done. No matter how many times we said it, thought it, or stared at the 210-foot span, I don’t think that anyone at that moment had an easy time comprehending the magnitude of our accomplishment. With the help of so many students, workers, sponsors, and mentors, we were able to physically leave an impact on the future of Ait Bayoud. 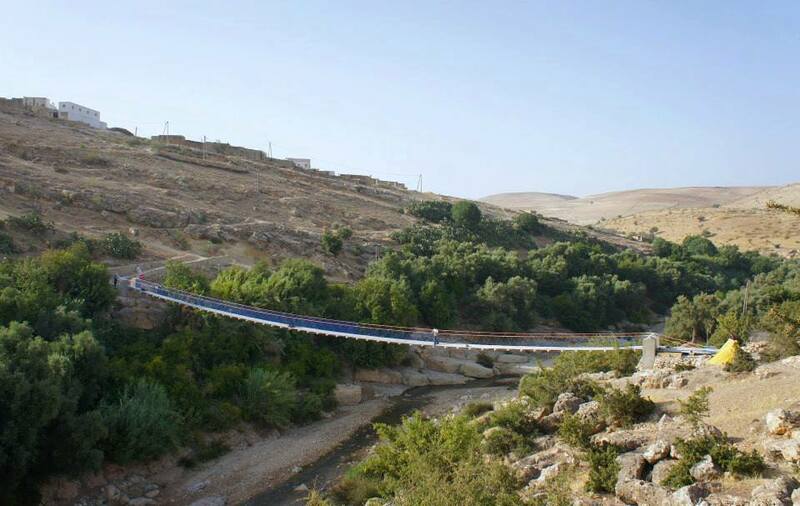 This bridge could help to send a child to school, help a mother in labor get to proper care, and possibly save someone’s life someday. In a matter of three weeks, I was able to see the culmination of so many years of hard work and dedication right before my eyes. When I walked across the bridge for the first time, I felt more than honored to be where I was, I felt spoiled. Here I was, a first-year student, traveling out of the country for the first time to experience working on a large-scale engineering project for the first time. I was given an incredible opportunity to experience another culture, make friends in another country, and finally understand why so much work has been done to complete this project. Even today, I am still amazed by the people I worked with for those three weeks, the people that traveled before, and everyone associated with EWB Morocco over the history of this project. We ran into our fair share of snags over the course of the last three weeks of the project, from tool and hardware failures to almost daily trips to Essaouira for supplies. Most of our trip was spent lowering, splicing, and tensioning ropes, as well as preparing deck pieces for the final installation. 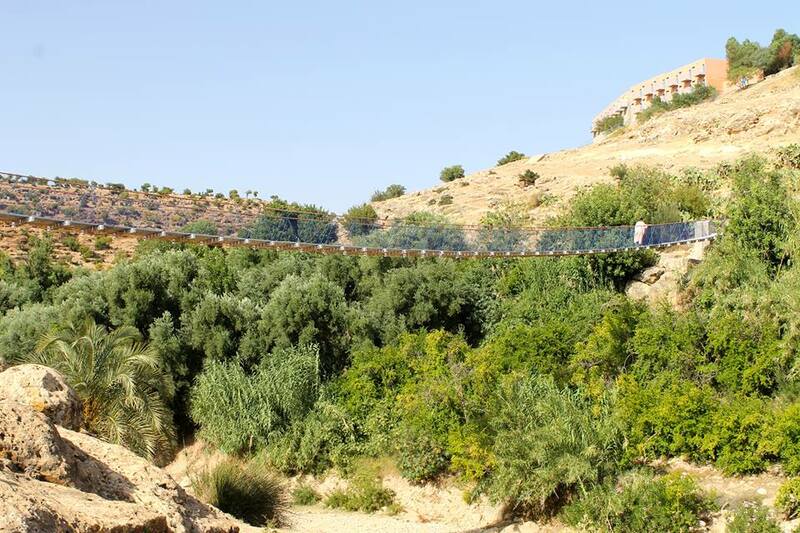 It was with only a week left that we actually began putting deck pieces on the bridge, and with only two days left that we began to put the safety fishnet on the bridge. Yet somehow, even when we encountered these snags in the pressing time, everyone worked together, focused a little harder, and pushed through to complete the task. 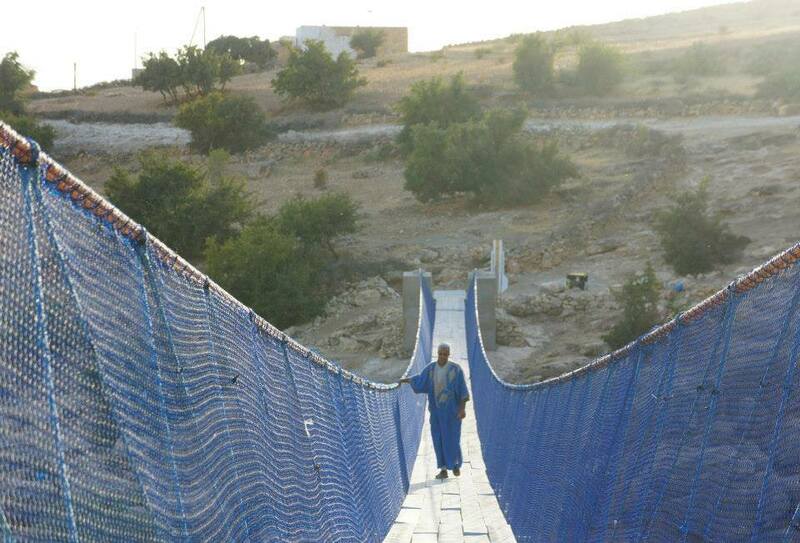 It’s still difficult for me to fathom that we, EWB Morocco, completed the longest synthetic cable suspension footbridge in the world for an absolutely incredible community, yet we did, and I couldn’t be any more proud. I’m excited to say that we’ve completed some very exciting milestones in the past few days. As Chloe mentioned, the rest of week two was filled with cable pulling (pictured below). Days and days of cable pulling . While our work days certainly grew longer–and hotter–the team fortunately fell into an efficient rhythm. We ran into various challenges along the way, such as releasing the tension and maneuvering the tensioning system around the ground rebar. Nevertheless, on Wednesday, we achieved a huge goal: we successfully pretensioned all ten ropes! I’m proud to say that we generated (literally) tons of tension without a single safety incident. Due to a shift in our schedule, Thursday became our new Essaouira day for the way. As such, we attended to various other tasks throughout the day, and I must admit that it was a relief to do something other than cable-pulling for once. 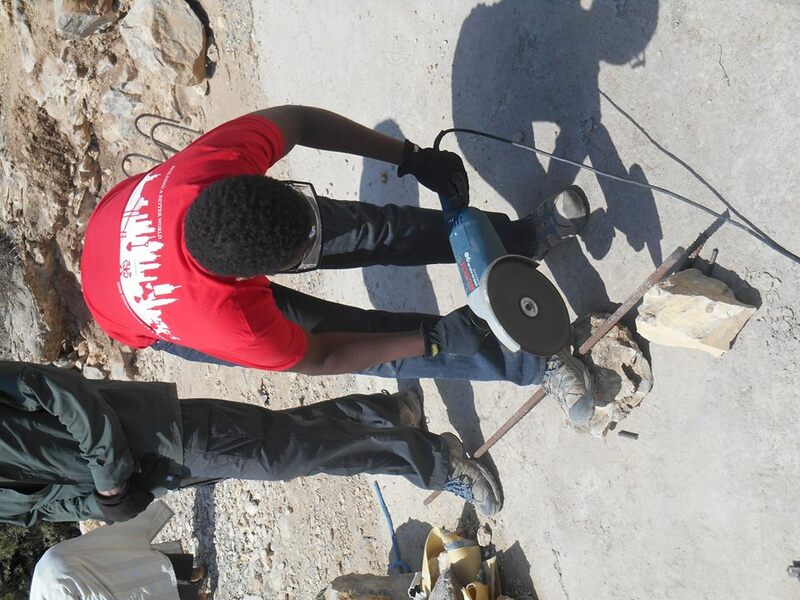 In preparation for the second travel team, we used the angle-grinder to cut rebar (action-shot below), determined what remaining wood needs to be purchased for the bridge and approach decks, and–with the help of Tahimi’s impressive metal-working skills–prepared the thimbles that will be used to permanently secure the ropes. To save time, we also decided to bring difficult pieces of wood for the Traveler in to Essa with us to be professionally cut. With that, the 6 of us (+ the Traveler wood + suitcases) piled into the rental car and spent Thursday night and Friday in Essa. On Saturday, the rest of the first travel team bid Morocco adiu and flew out of Marrakech, and the second travel team (plus 3 of the 4 remaining mentors) has taken our place in Ait Bayoud. While this has certainly been a challenging and hot 2.5 weeks, it’s hard to believe that the 2013 Summer Implementation trip is halfway over. I, as well as the rest of the first travel team, had a truly amazing experience, and I can’t to see the project progress over the next few weeks. This is a wrap for me, but check in later this week for more updates! Things are going pretty well so far. From last time, we found out that our dyno had some problems. It was not able to read anything past 3000 Ibs (Or that’s what we think). After consulting our mentors, we attached the dyno to our block and tackle system to lower the tension reading and continued with the rope tensioning process. 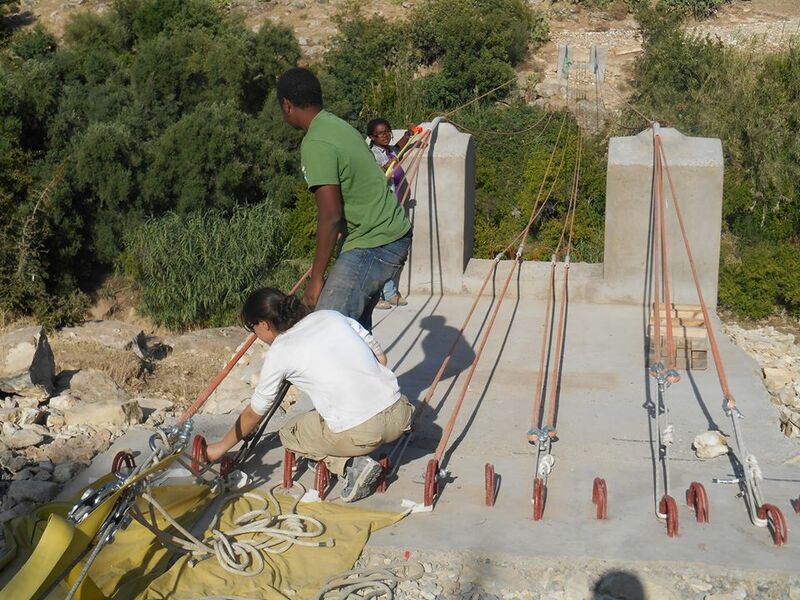 We successfully tensioned four cables since yesterday, and will be working on the rest of them this week. We were a little concerned about the comealong as a small part of the metal wire frayed, and the spring came off at one point, but all should be fine (fingers crossed!). We also finished most part of the traveller, mainly the top and bottom frames. It’s looking pretty good so far!